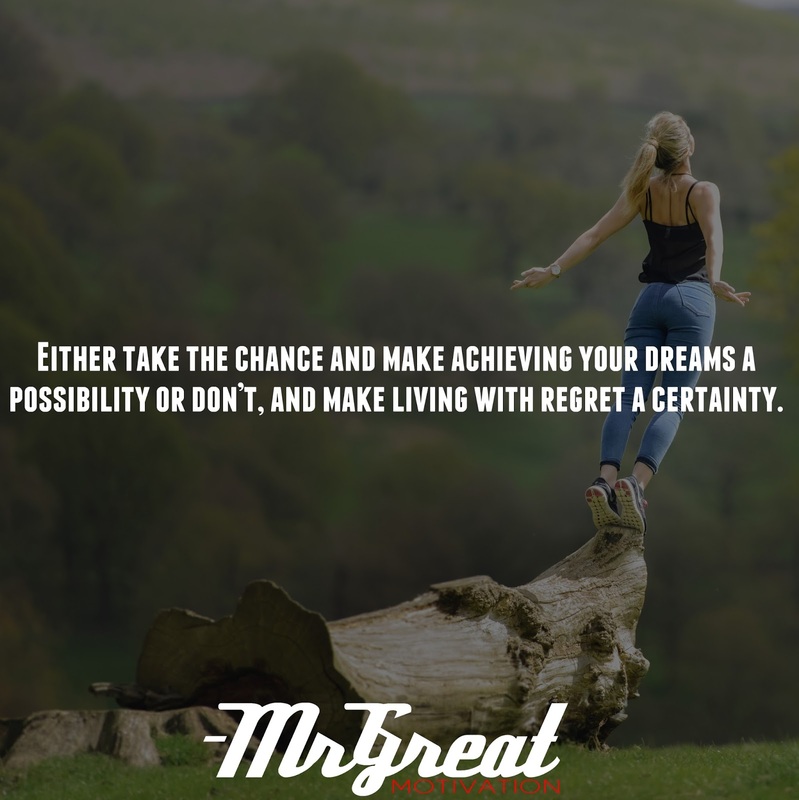 Either take the chance and make achieving your dreams a possibility or don’t, and make living with regret a certainty. Home Motivational Quotes Either take the chance and make achieving your dreams a possibility or don’t, and make living with regret a certainty. There are a million things that will be out of your control daily. It can be an irritable boss or a lot of your day-to-day living is completely left up to chance. Great achievers grow, produce, and enjoy success because they make smart decisions every day, no matter what life throws their way. They know their time on earth is short, and that every choice they make today can impact their future, for better or for worse. These people live a life free of regrets because they know they reacted to their station in life in the best way possible. Even if they encounter road bumps, they make smart choices to lay the groundwork for success the next time, no matter how tough it gets. Successful people don’t start with a million aspirations and attempt to work on every single one of them all at once. A goal is not vague, but rather it’s a specific, well-conceived desire. You can do this today by turning your dreams into specific, time-sensitive goals, and by placing them near the top of your priority list. Dreams don’t come true just because you spaced off during the workday. Successful people don’t only know this, but they use it to push themselves forward. Rather than regretting “what could have been,” they know they’ve made a concrete effort to move forward daily. Do it now. Stay motivated.